MY dinner appointment with Vikram was scheduled for 8pm at the Pacific Regency Hotel’s coffee house in Kuala Lumpur. He turned up on the dot. Wearing a two-toned shirt and jeans, he looked somewhat different from his onscreen persona in the over 25 movies he has acted in so far. Vikram’s hair was long, it had blond streaks and his macho-looking beard and moustache were missing. “This is my current look for the movie Anniyan (Alien) in which I play three different roles. If you had seen me yesterday, I looked different then too,” said Vikram, who had spent over 10 hours shooting for the movie at KLCC earlier in the day. “Let’s finish with the photo shoot first,” he requested, and went on to give a dozen poses – seated, standing, leaning, walking down a spiral staircase ? he even ventured so far as to share some tips with photographer Azlina Abdullah on how to take some captivating personality shots! Despite the hectic day, Vikram appeared relaxed, approachable and friendly. He had a bowl of salad and warm water during the two-hour interview when he spoke freely about his childhood, painful moments in the movie world and his success at being extraordinary in his roles. Among his famous movies to date are Arul, Saamy, Dhool, Kdhal Sadugudu and Gemini. Last June, he won the India Filmfare Best Actor Award for the acclaimed Pitamagan, directed by Bala, in which he played an insensitive orphan who grew up in a graveyard. For the movie, Vikram did his own make-up and “mud-caked” himself. 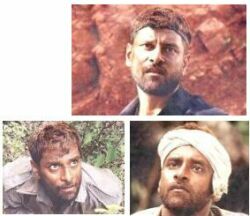 The many faces of Vikram in Pitamagan, the movie that shot him to fame. Pitamagan remains very much talked about till today because of Vikram's unconventional portrayal of a grave digger - a role with no dialogue. It was a role that shot him to fame. Pitamagan remains very much talked about till today because of Vikram’s unconventional portrayal of the undertaker. It was a role without any dialogue and the actor’s acting muscles were stretched as he had to use body language and facial expressions to convey his feelings and thoughts. Currently, Vikram is the only actor trying to be different in Kollywood’s (that would be the South Indian) movie industry. “I don’t want to do normal roles and I want to be different. I sit with the movie director and meticulously go through the details of the character I undertake. “I like to do one film at a time and I give my whole heart to it. I eat, drink and sleep thinking of the movie I’m currently acting in,” he said. Following his Pitamagan success, Vikram’s role as an obsessive lover and mental patient in Sethu, turned into another box-office success. Vikram isn’t afraid of going the extra mile: In the movie Dhil he trimmed his hair, went on a strict diet (eating only fruits and drinking juice) to grow lean. After this, he had to put on weight instead for the role of a police officer in the movie Kadhal Sadugudu. In the movie Kaasi in 2000, Vikram played a blind singer. For the movie, he sunbathed on the terrace of his beachside home in Chennai (for a sunburnt look) and got dizzying headaches while practising to look blind. For four years in a row, Vikram has had nothing but hits – an achievement in any film industry but especially in Tamil cinemas, which have been lacking in notable movies for the last five years. Vikram explained that his move to play different characters was inspired by Indian movie star Kamalhassan and Rajnikanth. “All my films come with different dimensions now – love, sadness and action – and each film has a theme and message for every viewer,” said Vikram. His audiences see him as a breath of fresh air. This is evident from the number of fan clubs – 2,000 – devoted to the Tamil hero. Vikram as a blind singer in Kaasi (2000). For his role, the actor - who believes in going the extra mile - sunbathed on the terrace of his beachside home in Chennai (for a sunburnt look) and got dizzying headaches while practising to look blind. According to Vikram, Sethu was a turning point for him. Prior to this many of his movies were failures. “My earlier movies received poor response and sometimes there were only 15 people in the cinema hall. I used to sit with the audience and watch their reactions to my movies. After each session, I interviewed some of them and obtained their feedback. Some gave me the thumbs up while several gave critical comments. “I also used to plead with the cinema operators to give my films a chance by giving more airtime,” Vikram said, adding that his childhood dream was to become an actor. “I’m elated now because I’m finally recognised as an actor who can perform different roles. Hard work does pay and this has spurred me on to do better. “But success should not go to our heads and failure should not go to our hearts. I live a simple life, still ride a motorbike and eat and shop at the same public places as before. “When I arrived in Kuala Lumpur, they wanted to arrange 10 bodyguards for me but I declined. I want to be free and be connected with people and my fans,” said Vikram. This visit was Vikram’s first shooting stint in Kuala Lumpur, and he enjoyed the food here, especially satay.